dmd Europa. Is a Dynamic Mural is an interactive installation that shows a mural that was painted over a period of a week in a film that's only a few minutes long. Spectators can interact by changing the perspective and the speed of the projection. Dynamic Mural consists of a 1/1 scale projection of a black and white painting made up of five pictures representing several of the artist's creative themes. The film synthesizes a week's work and weaves together biological elements, illness, burocracy, lonliness and orgies. 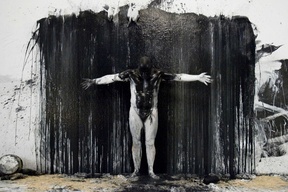 These themes lead to actions where the artist's body, the wall and the painting become one. An interactive system, with sensors in the floor, enables the spectator to choose one of three videos that run concurrently. These three films show different perspectives at varying speeds. The simple interaction system enables the spectator to edit the mural's creation at will. Jumping repeatedly on the sensors is a rewarding experience. DMD was produced by the Civica Galleria d’Arte Moderna de Gallarate, Lombardy, Italy and was created especially for the exhibition Interattività Furiosa, pre-interactividad and Sistematurgia. This exhibition presents some of Marcel.li's most well-known installations such as Réquiem (1999) and Tantal (2004) in addition to a complete video catalogue of his mechatronic performances. Nevertheless, the recurring theme in the exhibition is his drawings. The artist is a prolific creator of drawings and yet this aspect of his work is little known. 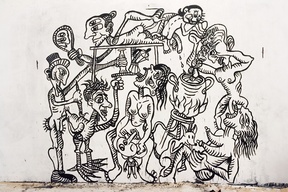 Three hundred drawing have been chosen and they are organised in five mural panels: Transpermia, Protomebrana, Afasia, El Dibuixant and Sistematurgia. Marcel•lí uses this technique as an interactive prototype for his performances, as the starting point for his animations and a means for making his reflections visually accessible. Drawing thus becomes pre-interactive material and a reflection on his creative methodology: Sistematurgia. Produced by Panspermia S.L. and Civica Galleria d'Arte Moderna di Gallarate..
Assistents gràfics: José Manuel Funes, Wahab Zeghlache, Oriol Corbella, Guergana Tzatchkov, Manuel Bozzo, Charity Blansit.